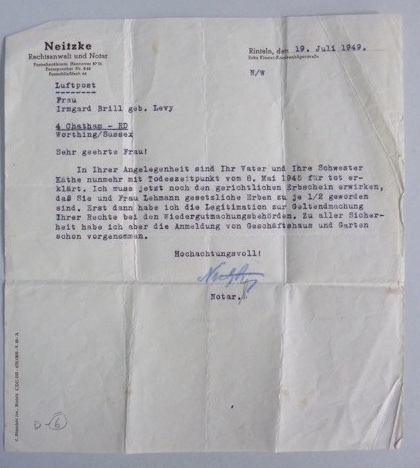 Regarding your case, your father and sister, Käthe, are now declared dead with the timing of death of 8th May, 1945. I must still obtain the judicial succession that you and Frau Lehmann have become the legal heirs, each 50/50. Only then do I have the legitimacy to make the assertion of your rights with the reparations authorities. In all certainty, I have however already carried out the registration of the commercial building and garden.